24 Mar Call the feds. Australian dollar rises. Another interesting week in the markets this week. 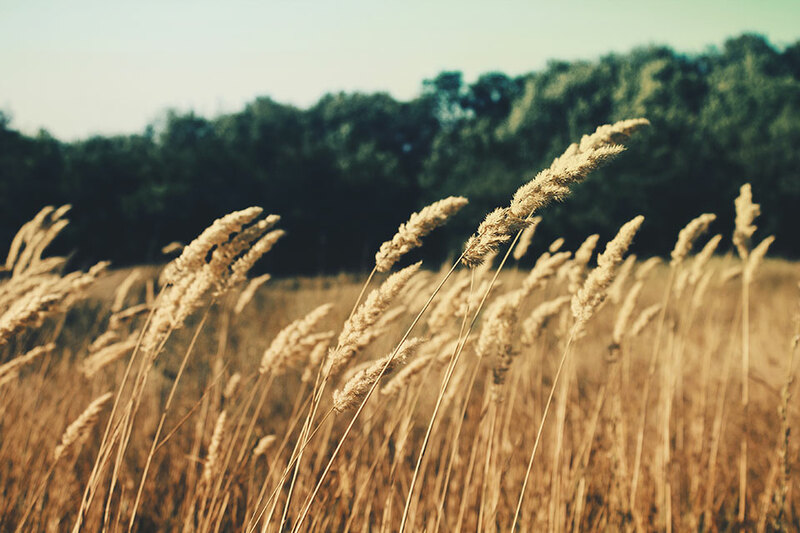 The grain markets lost some ground, before regaining their losses. The US fed increased interest rates for the 2nd time in three months, however the impact on the A$ was not as expected due to less hawkish sentiment. 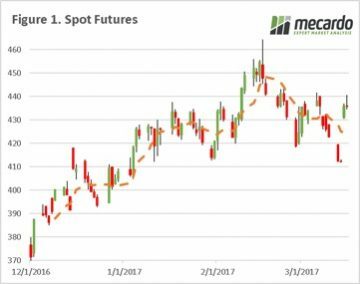 Early this week wheat futures fell on the back of lack of fresh data, and encouraging crop conditions in eastern Europe. The generally benign conditions and the large global surplus is keeping a dampener on large upside potential. The market fell around 15¢/bu ($5.7USD/mt), before regaining strength to hold currently 8¢/bu ($2.3USD/mt) above last Friday (figure 1). At a local level we saw basis levels fall across the board (figure 2). 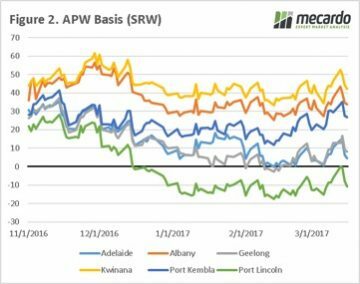 The average change from early this week to yesterday was $8/mt, although the Eyre Peninsula was the poor cousin losing $10/mt in basis. In the chart it is quite clear that Port Lincoln since early December has struggle to gain any local strength. This week the US fed jacked up their interest rates by 25 points, typically this would put pressure on the Australian dollar however this was not the case. 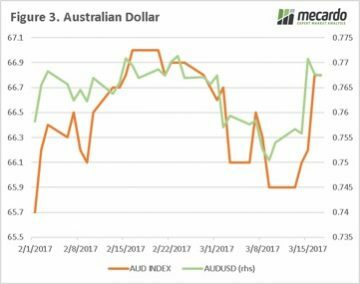 The Australian dollar rose to above 77¢ (figure 3), and the AUD trade weighted index rose dramatically. The fall in the US dollar was a result of the trade expecting, more bullish sentiment in the fed commentary, with the expectation of a more expedient increase in rates over the next 12 months. At a local level some analysts are projecting an Australian rate rise as being likely in the coming months. However, with inflation as low as it is at the moment its unlikely to see a local interest rate increase in the short term. There are some concerns in the US related to dry weather, and eyes will be on weather forecasts pointing toward a deluge in the coming weeks. If this eventuates it will lead to an improvement in US crop potential. As always at this time of year the focus is on the performance of the northern hemisphere, and each week which passes without incident will result in an eventual erosion of any weather premium in the market.